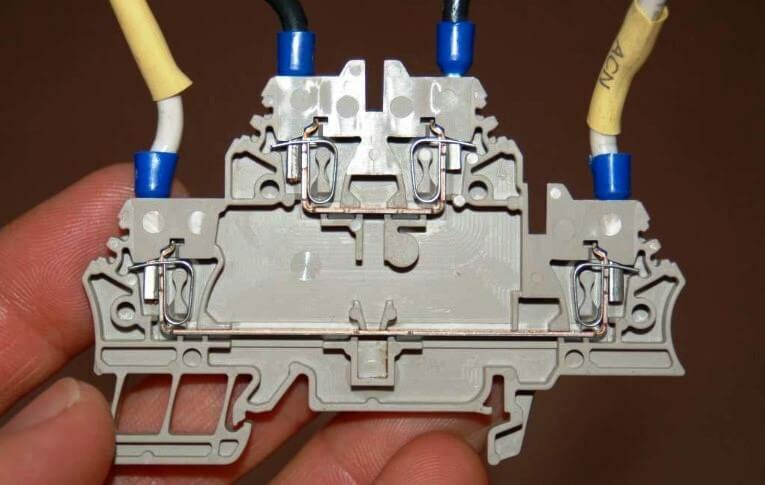 There is much to be said for neatness of assembly in electrical signal wiring. Even though the electrons don’t “care” how neatly the wires are laid in place, human beings who must maintain the system certainly do. Not only are neat installations easier to navigate and troubleshoot, but they tend to inspire a similar standard of neatness when alterations are made. The following photographs illustrate excellent wiring practice. Study them carefully, and strive to emulate the same level of professionalism in your own work. Beyond esthetic preferences for instrument signal wiring are several practices based on sound electrical theory. 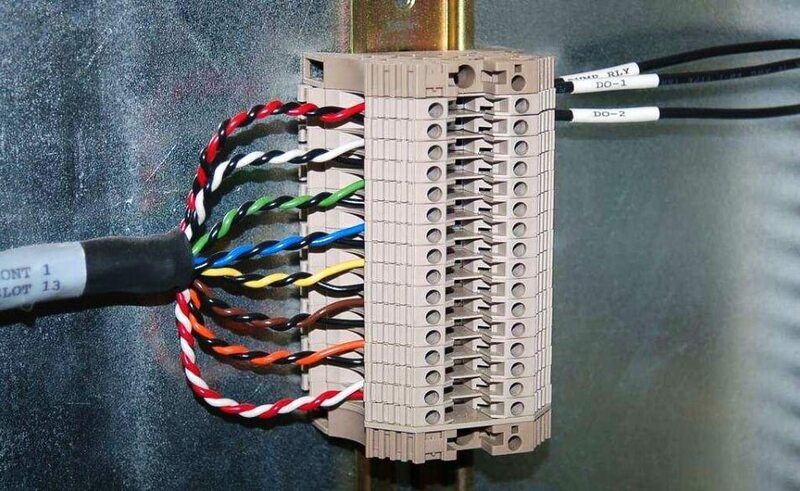 The following subsections describe and explain these wiring practices. 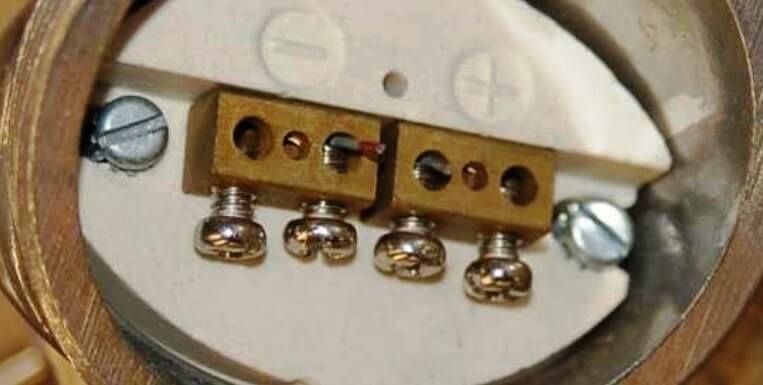 Many diﬀerent techniques exist for connecting electrical conductors together: twisting, soldering, crimping (using compression connectors), and clamping (either by the tension of a spring or under the compression of a screw) are popular examples. 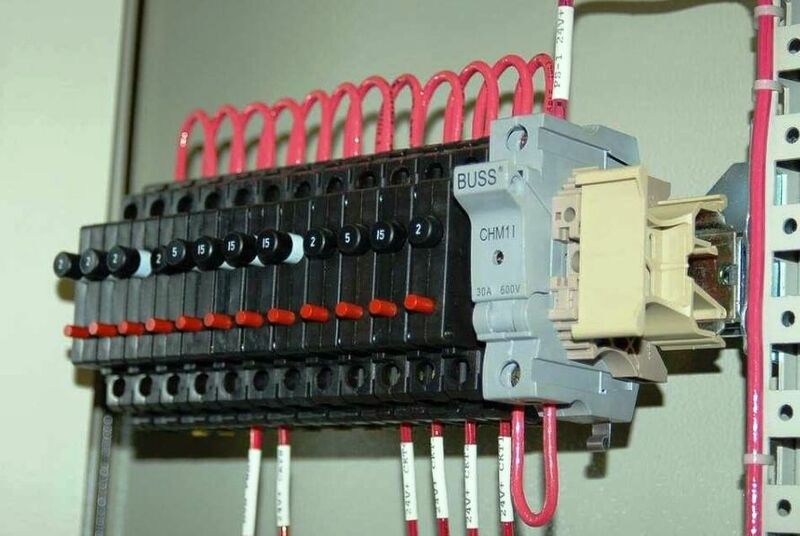 Most industrial ﬁeld wiring connections utilize a combination of compression-style crimp “lugs” (often referred to as ferrules or compression terminals) and screw clamps to attach wires to instruments and to other wires. Also evident in this photograph is the dual-level connection points on the left-hand side of each terminal block. Two pairs of twisted signal conductors connect on the left-hand side of each terminal block pair, where only one twisted pair of wires connects on the right-hand side. This also explains why each terminal block section has two screw holes on the left but only one screw hole on the right. 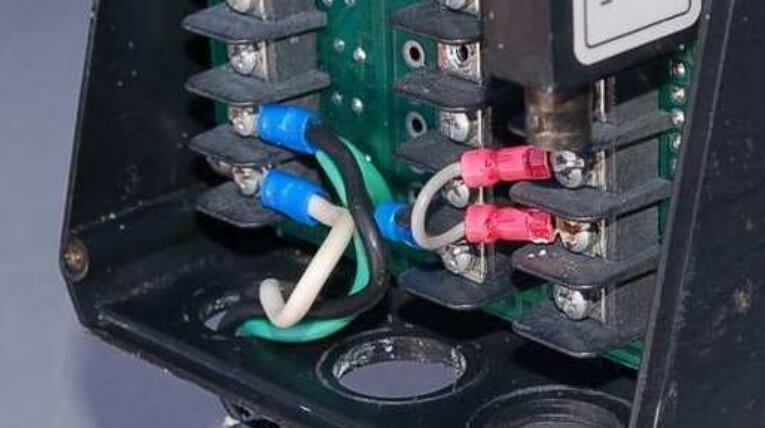 If another wire were secured by the screw clamp on the left-hand side of this terminal block, it would be made electrically common with the wire on the right-hand side by virtue of the metal bar joining both sides. 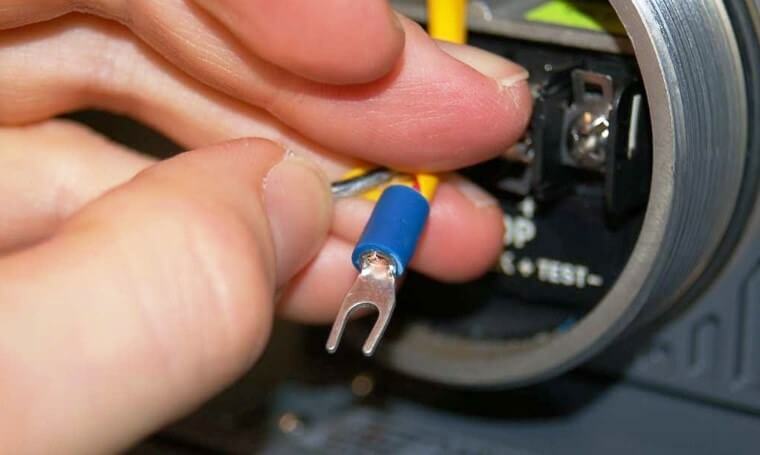 In order to extract or insert a wire end from or to a “screwless” terminal block, you must insert a narrow screwdriver into a hole in the block near the insertion point, then pivot the screwdriver (like a lever) to exert force on the spring clip. 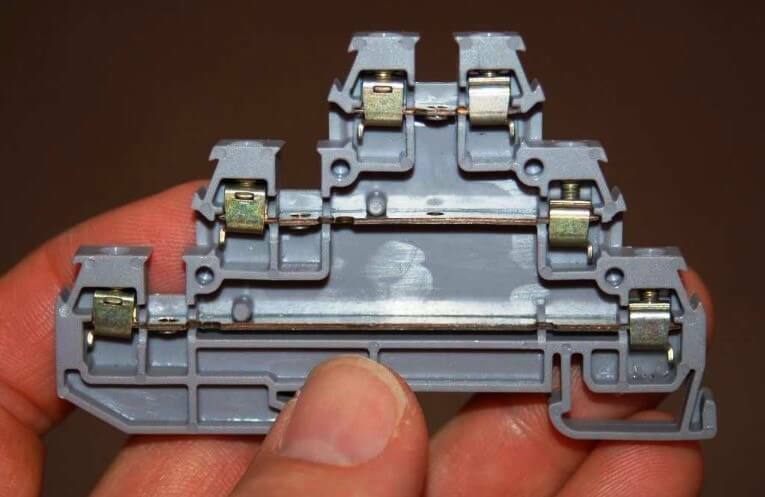 Screwless terminal blocks are generally faster to terminate and un-terminate than screw type terminal blocks, and the pushing action of the release tool is gentler on the body than the twisting action required to loosen and tighten screws. 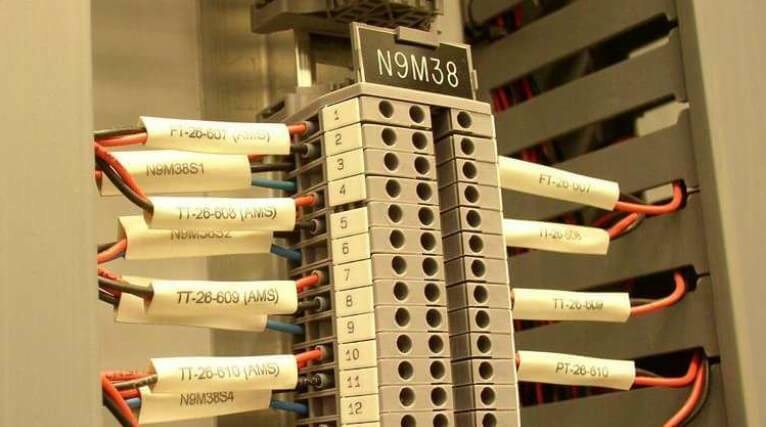 Some multi-level terminal blocks provide the option of internal jumpers to connect two or more levels together so they will be electrically common instead of electrically isolated. This use of a multi-level terminal block is preferable to the practice of inserting multiple wires into the same terminal, when wires need to be made common to each other. The rotary force applied to each wire’s tip by these screws necessitates the use of solid wire. Stranded wire would become frayed by this combination of forces. Many ﬁeld instruments, however, do not possess “block” style connection points at all. Instead, they are equipped with pan-head machine screws designed to compress the wire tips directly between the heads of the screws and a metal plate below. The problem with directly compressing a wire tip beneath the head of a screw is that the tip is subjected to both compressive and shear forces. As a result, the wire’s tip tends to become mangled with repeated connections. Furthermore, tension on the wire will tend to turn the screw, potentially loosening it over time. 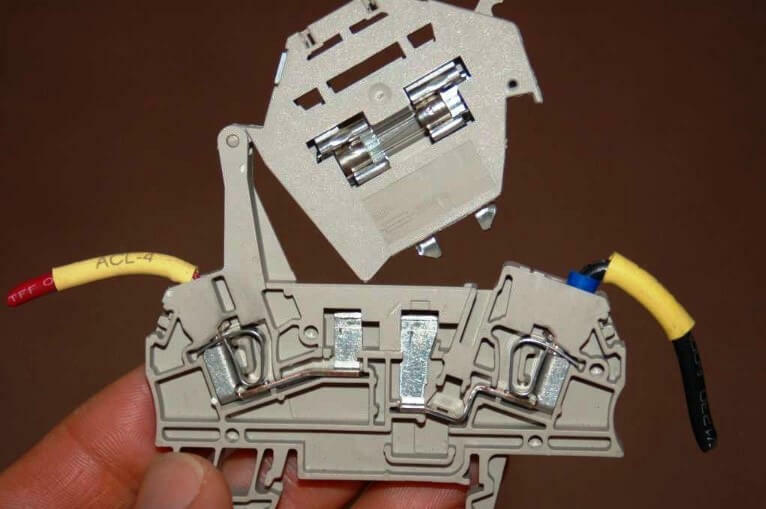 This termination technique is wholly unsuitable for stranded wire , because the shearing forces caused by the screw head’s rotation tends to “fray” the individual strands. 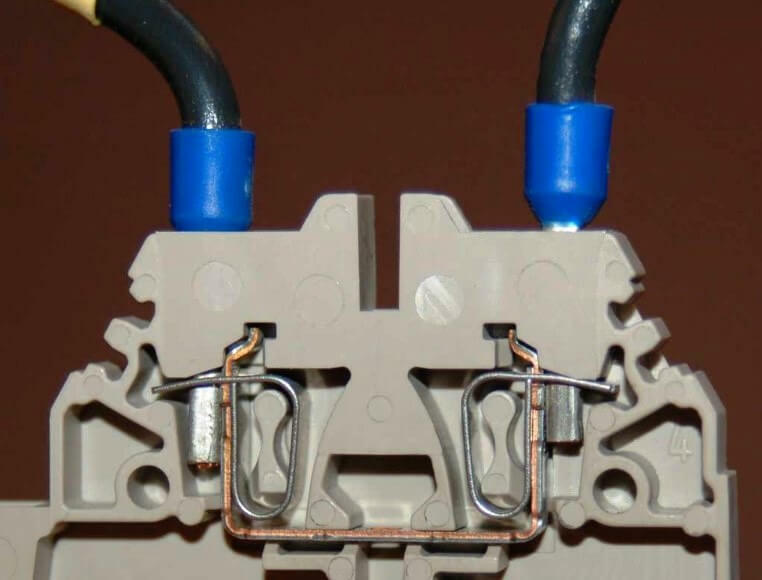 The best way to attach a stranded wire tip directly to a screw-style connection point is to ﬁrst crimp a compression style terminal to the wire. The ﬂat metal “lug” (ferrule) portion of the terminal is then inserted underneath the screw head, where it can easily tolerate the shearing and compressive forces exerted by the head. Fork terminals are easier to install and remove, since they merely require loosening of the connector screw rather than removal of the screw. 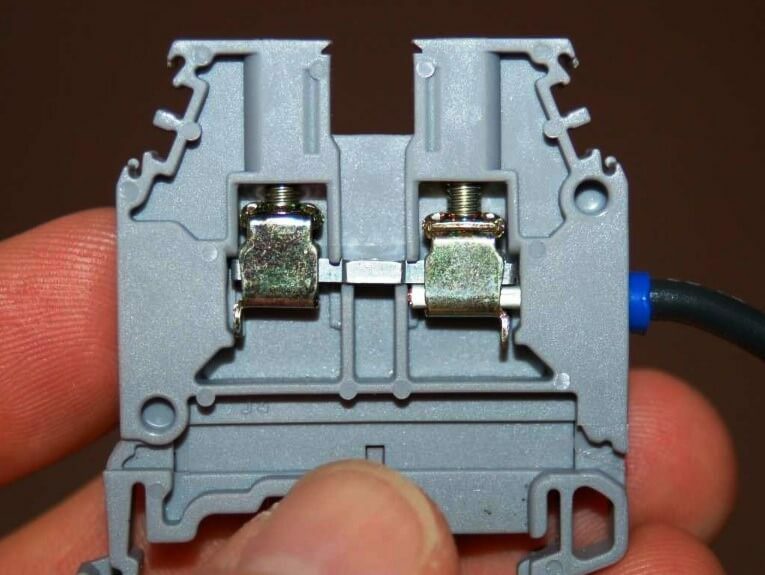 Ring terminals are more secure, since they cannot “fall oﬀ” the connection point if the screw ever accidently loosens. 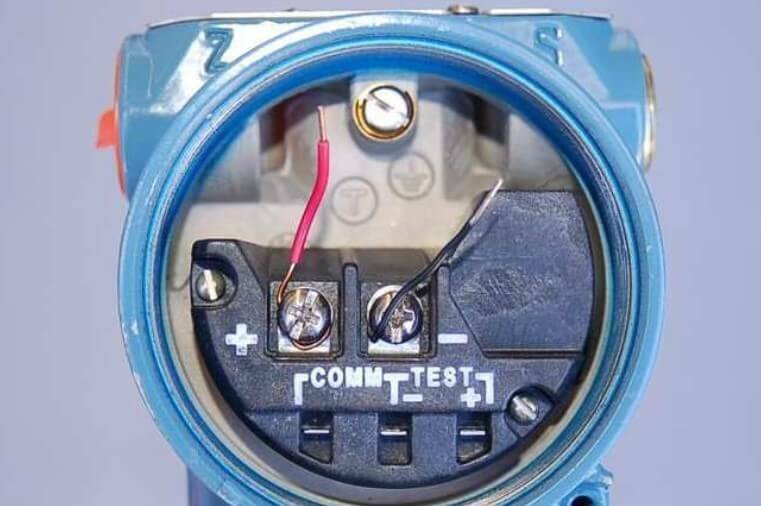 Just as direct termination underneath a screw head is wholly unsuitable for stranded wires, compression-style terminals are wholly unsuitable for solid wire. 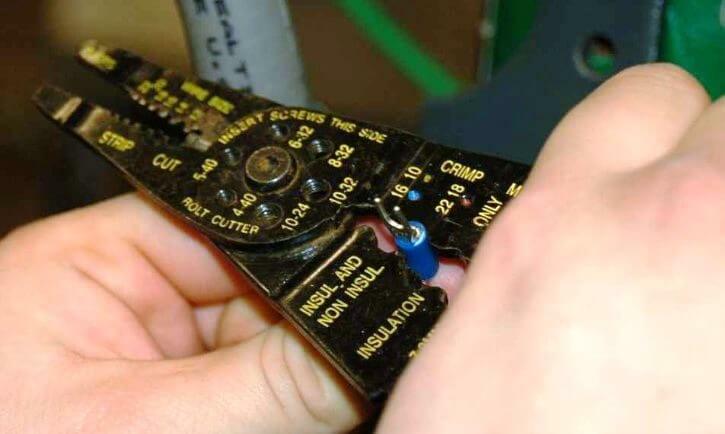 Although the initial crimp may feel secure, compression terminals lose their tension rapidly on solid wire, especially when there is any motion or vibration stressing the connection. 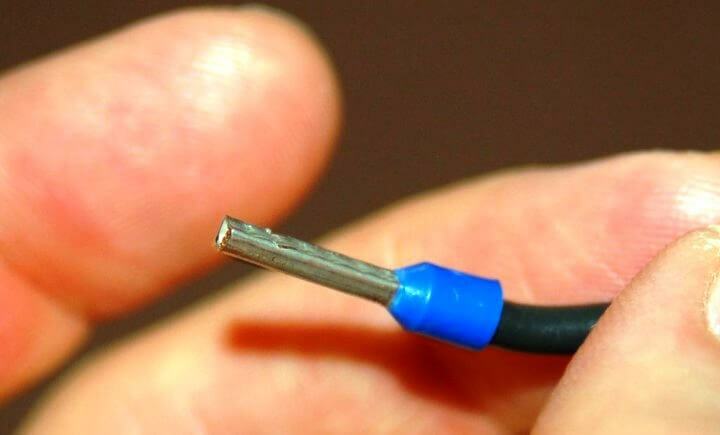 Compression wire terminals should only be crimped to stranded wire! What is DIN rail ?